You would think that writing about the latest version of Ubuntu 14.04 would be easy but it is hard to write about one of the biggest Linux distributions without repeating everyone else’s sentiments or covering the same ground that was covered with Ubuntu 13.10. With that in mind please don’t be disappointed that much of what I will be writing here has been written before. There is nothing revolutionary about Ubuntu 14.04, especially if you have already tried Ubuntu 13.10, Ubuntu 13.04, Ubuntu 12.10 and Ubuntu 12.04. The improvements to Ubuntu have been slow and steady. So what does that say about Ubuntu? Have they ran out of ideas? Is it a distribution just coasting along on former successes? No. I think the developers are doing it right. When Unity was first released it caused a major backlash with every man, meerkat and narwhal having an opinion. Unity still divides opinion today but whereas at the time everyone seemed to be struggling with the new interface there are now a great number of people who swear by it. If you are currently reading this from a computer running Windows 8 then you should realise that the Unity interface, whilst more modern than the traditional desktop, is far more intuitive and much easier to navigate. 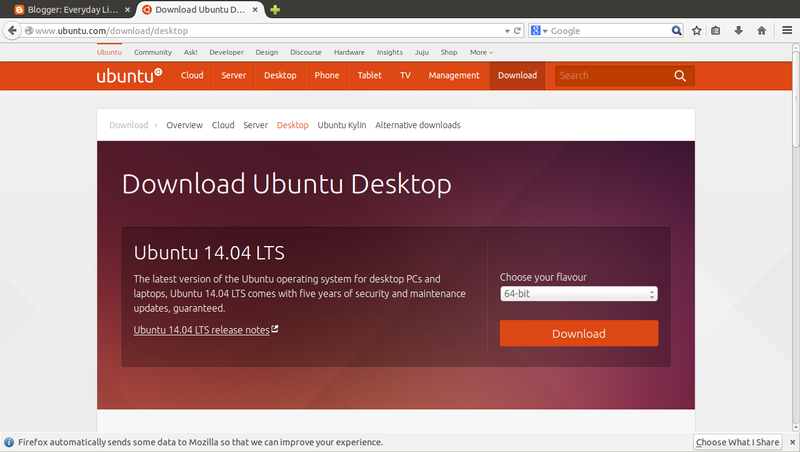 You can download Ubuntu as an ISO image from http://www.ubuntu.com/download/desktop. Once you have the downloaded image burn it to a DVD using disc burning software. 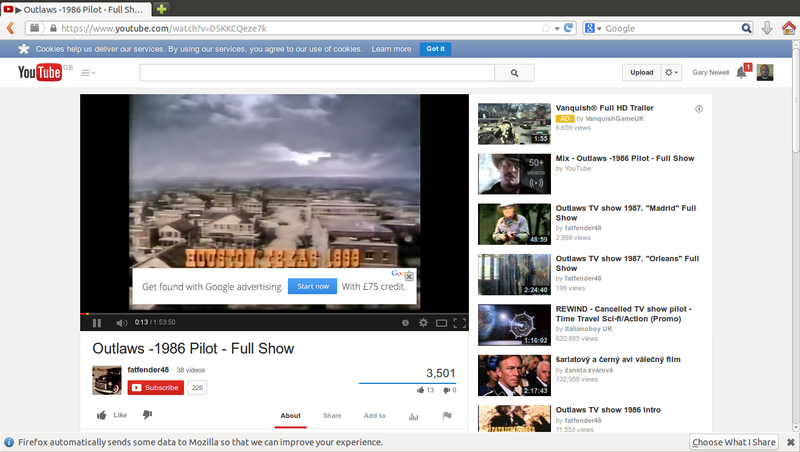 Alternatively you can use a program such as UNetbootin. There are instructions showing how to create a DVD and USB drive on the Ubuntu website. Using a computer without UEFI makes installing Ubuntu 14.04 a breeze. If you are using a computer with UEFI then it is still supposed to be a breeze but quite often isn’t. Here is a link to the official Ubuntu installation guide. 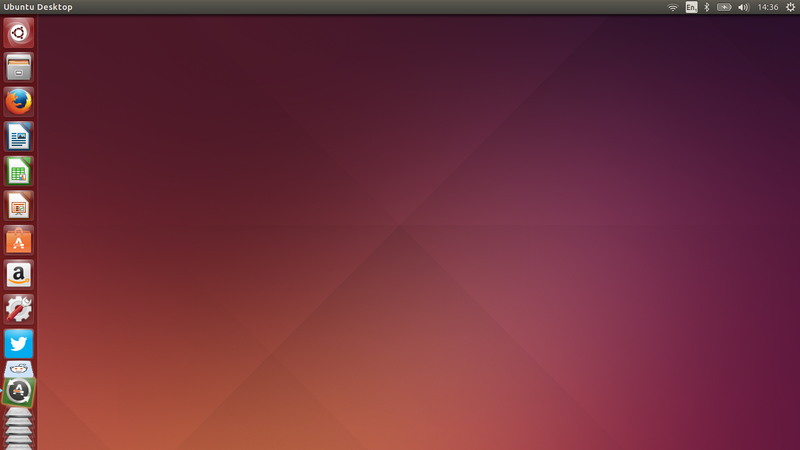 I have also written a dual boot guide showing how to install Ubuntu 14.04 alongside Windows 8.1. Click here for a list of system requirements. So, one of the biggest problems I found with Windows 8 is the method used for launching applications. In Windows 8 you have the tiles which when clicked launch an application. Any application that isn’t in a tile has to be launched by bring up the search icon and then searching for the application. If you are viewing the desktop as opposed to the tile view (for instance because you are using a standard Windows style application) and you want to run another application (for example snipping tool to take a screenshot) then you have to go back to the tile view to get to it. It is all very slow and cumbersome. Now I know that the Windows experts amongst you will tell me there are some keyboard shortcuts that can do it quicker but where are they documented? If you are running Windows 7 then you might feel a little more smug because the interface is fairly standard. It looks and feels familiar and running programs is a breeze. 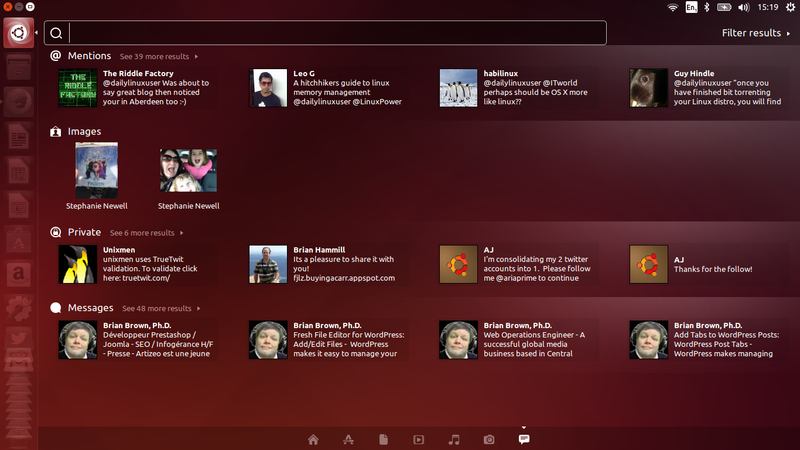 Take a look at Ubuntu’s Unity interface. It does everything right that Windows 8’s tile interface does wrong. For launching the most commonly used applications the Unity interface provides a quick launch bar down the left hand side. Critics of the Unity interface quite often complain at the fact that there isn’t much you can do to customise the look and feel. Whilst that may be true you will soon see that Unity is so intuitive that you don’t really need to customise it. Unity is for people who are interested in running applications as opposed to pimping their desktop. The top icon on the launch bar pulls up “The Dash” which is used to find and run applications, listen to music, watch videos, converse online and view your photo collection. Other icons include access to a file manager, the Firefox web browser, LibreOffice, the software manager, Amazon and the system settings. At the top of the Unity desktop is a black bar and this is used to host the menus for running applications (although from 14.04 the menus can be hosted in the applications own windows again). On the right side of the black bar are some key icons that enable you to adjust network settings, choose keyboard layouts, connect to Bluetooth devices, adjust power settings, adjust audio settings, see the time and shutdown the computer. To run an application you can either click one of the icons in the launcher or you can press the button at the top of the launcher. Pressing the super key (windows icon) on your keyboard also pulls up the dashboard. You will now see a screen known as the dash. I am going to run through the dashboard in a little while but before I do I would just like to say that most files and programs can be found simply by typing into the search box. I find that I can run most applications within two or three keystrokes. It is much quicker and easier than using Windows 7, Windows 8, the KDE desktop, Gnome desktop or pretty much any other desktop. You will notice from the screenshot above that there are a number of little icons at the bottom of the dashboard. These give you access to different scopes. The applications scope shows you any recently used applications, a summary of installed applications and suggestions for applications you might like to install. You can filter the results (see top right) and you can expand the installed applications by clicking the see more results option. In all seriousness though to find the application you want just start typing in the search bar. 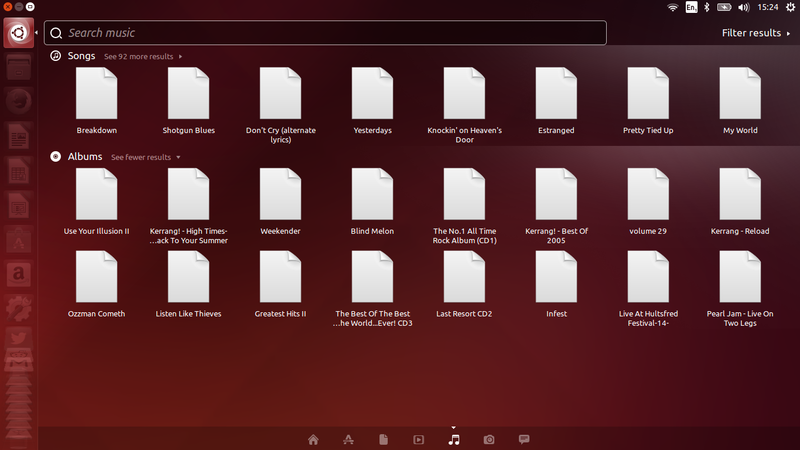 The files scope shows you the most recently accessed files, any downloaded files and folders/drives on your computer. 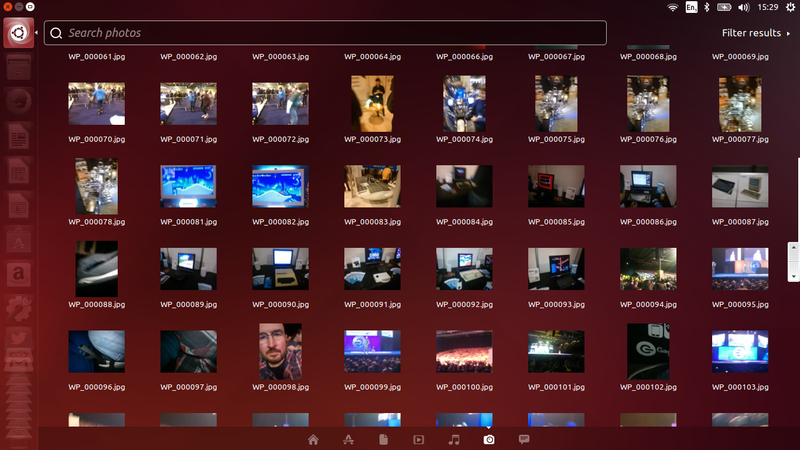 Again it is easier to find a file by using the search function. The videos scope gives a view of the videos on your computer, online and some suggestions. The music scope shows your music collection. You can adjust the view by changing the filters. The music scope is linked to the default music player which is Rhythmbox so before any files appear here you will have to import them into Rhythmbox. The photos scope provides a view of the images on your computer. 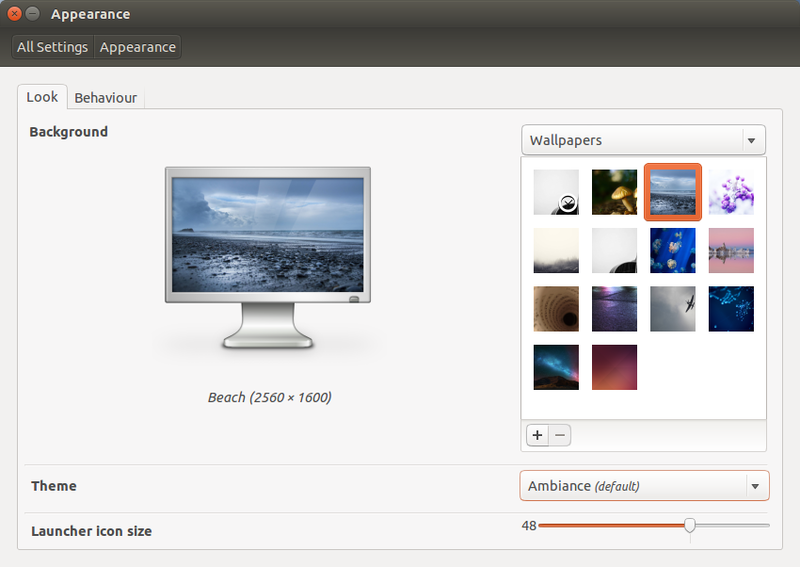 This scope is linked to the default image manager which in Ubuntu is Shotwell. Before any images appear you need to import them into Shotwell. The final scope is the online lens which links to online accounts such as Google+ and Twitter. Whilst this scope lets you view recent communications there is no way to reply. You can retweet though. I have used Ubuntu for a long time and I have to say that despite having all these scopes, I really only ever bother launching applications via the dash and to do that I press the super (windows icon) key and start typing. It is quick and easy. Earlier I mentioned that in Windows 8 there are lots of hidden keyboard shortcuts. 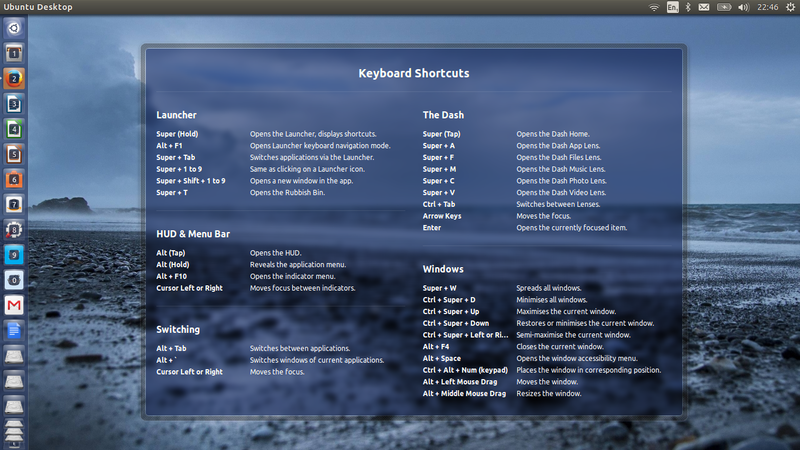 In Ubuntu and Unity there are also a number of keyboard shortcuts but they aren’t hidden. Simply hold down the super key and a list of shortcuts will appear. Connecting to the internet is easy. Press the network icon in the top right corner and then choose the wireless network that you wish to connect to. If the network you are connecting to is secure then you will need to enter the security key (only the first time). 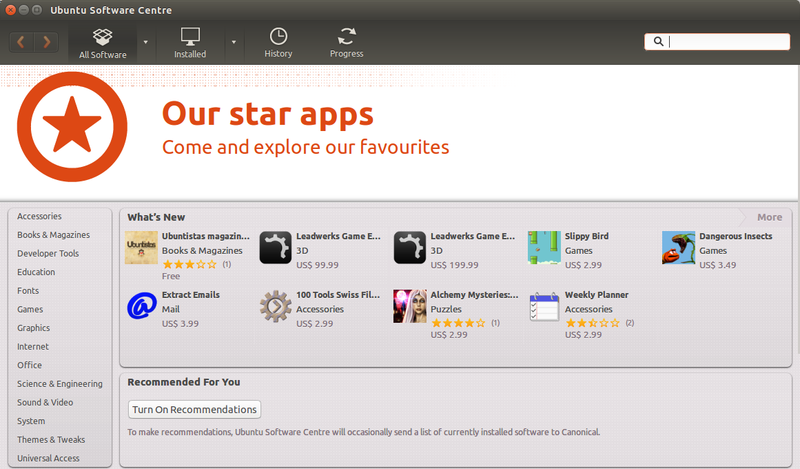 The Ubuntu Software Centre is used to install applications. You can start the software centre by clicking on the suitcase icon on the quick launch bar. The interface is fairly easy to use with a list of categories down the left, the results in the right and a search box in the top right corner. The results that are returned include a mixture of free and paid for options. To get Flash and MP3s to play you need to install the Ubuntu Restricted Extras package. 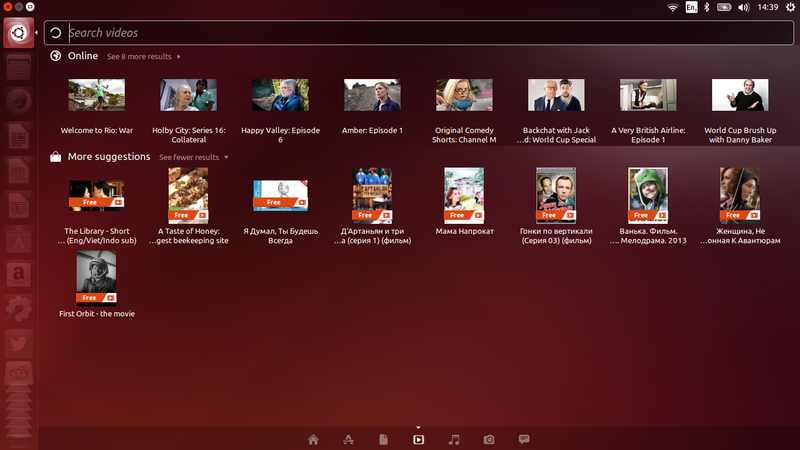 You can find the restricted extras package within the Ubuntu Software Centre. select the relevant option. (This isn’t immediately obvious). 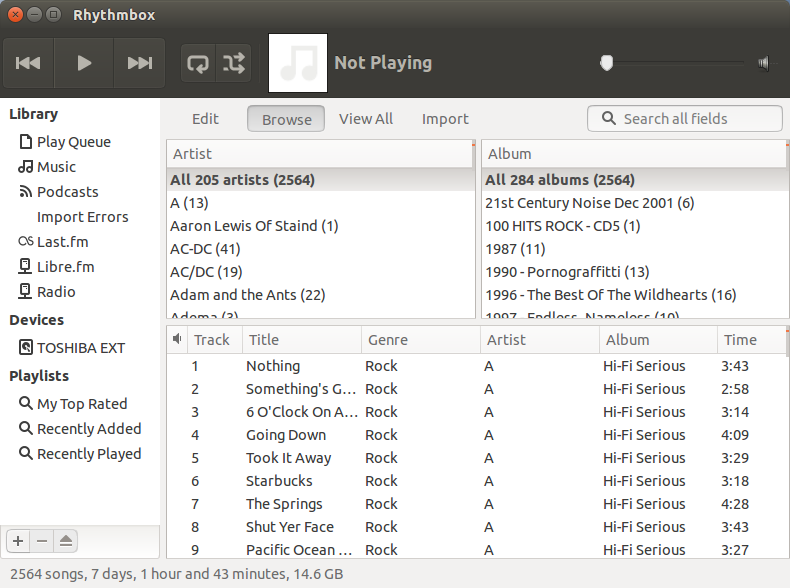 Rhythmbox is the default music player within Ubuntu and it has a very good user interface and links well with external devices such as Sony Walkmans. The Linux operating system may have been playing catch up on Windows for some time with regards to gaming but it is definitely gaining momentum now. There are now 500+ games available for Linux via the STEAM platform. In addition to STEAM there is also Playforlinux which lets you play Windows games within Ubuntu. 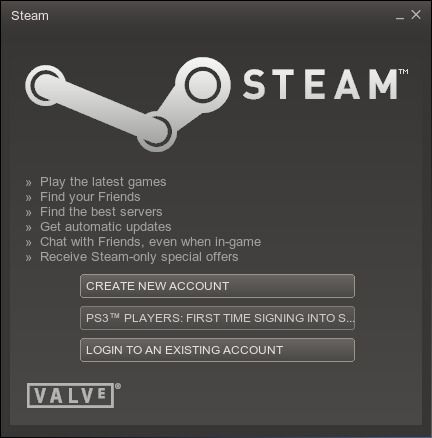 STEAM is installed by default but Playforlinux has to be installed via the Ubuntu Software Centre. Playonlinux has links to a large number of games from GOG.com. I recently bought Sensible World Of Soccer from that site which was a great blast from the past. It works flawlessly via Playonlinux and WINE. 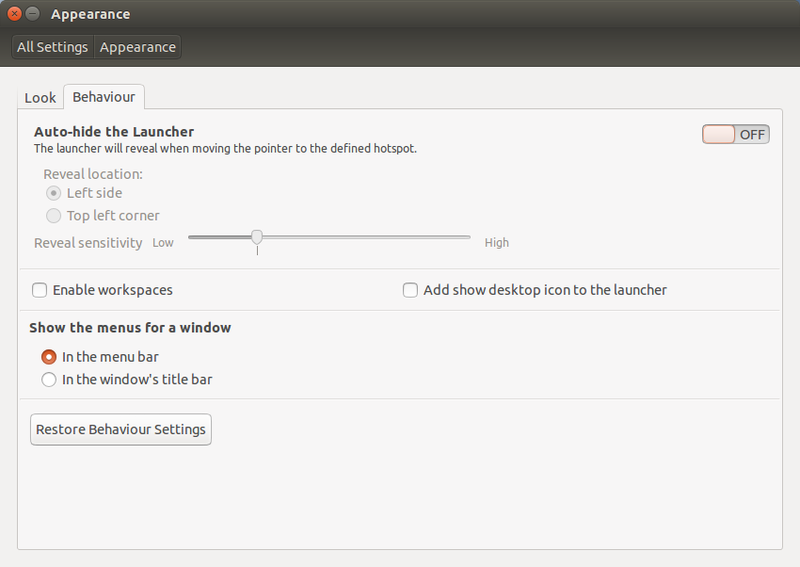 I mentioned previously that one of the main criticisms of Unity is that it isn’t as customisable as other Linux desktops. Whilst this may be true it doesn’t mean that you can’t change certain aspects. For instance you can change the desktop wallpaper by clicking on the settings icon (cog and spanner) and then choose “Appearance”. There are a number of different wallpapers included by default but you can add one of your own if you so wish. There are other things you can do as well. For instance you can change the size of the icons in the launch bar. This is useful on a netbook where screen real estate is more limited. It is also possible to hide the launch bar and have it reappear when the mouse hovers over a hot spot (such as the top left corner). 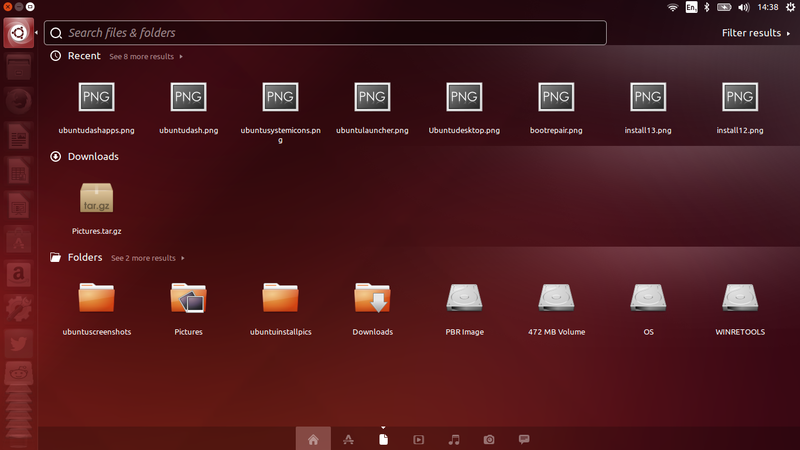 New to Ubuntu 14.04 is the ability to have menus as part of the window’s title bar. The default behaviour in Unity is to have all the menus appear in the black panel at the top. The new feature lets you have the menus per application window. The downside of having the menus in the top panel is that it is sometimes hard to work out which application the menu is appearing for. For example I could have Firefox open and I will be editing a blog post, then I might have LibreOffice open as well. I move to the top to access the menu and think that it is the LibreOffice one. I then choose File -> Close. To my surprise Firefox closes. Why? Well without realising it the focus was actually on Firefox and not LibreOffice. By having the menus in the application window it prevents this confusion. To set up online accounts for use within the online scope in the dashboard, click on the settings icon and choose the “Online Accounts” option. You can now add accounts by selecting the service you want to connect to and click “Add Account”. 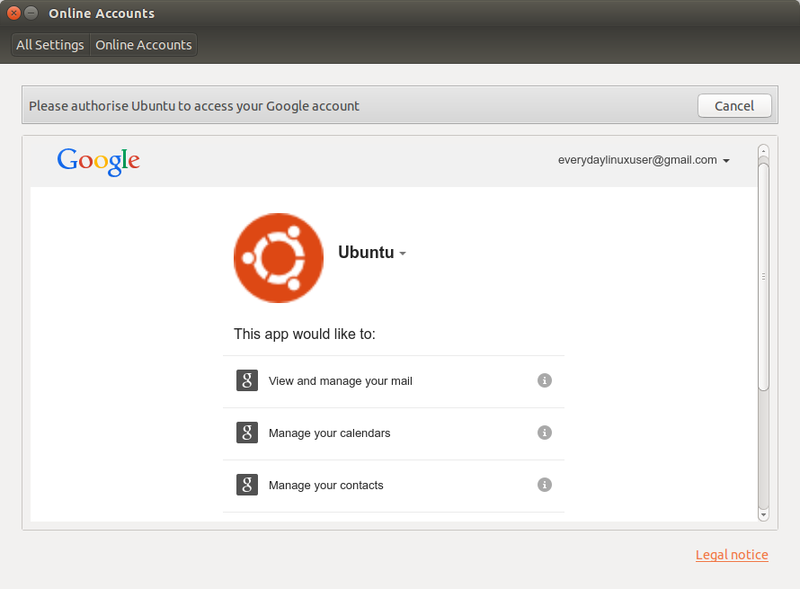 In addition to this though when you visit a site such as GMAIL, Reddit, Twitter etc you will see a message asking whether you want to integrate into Ubuntu. 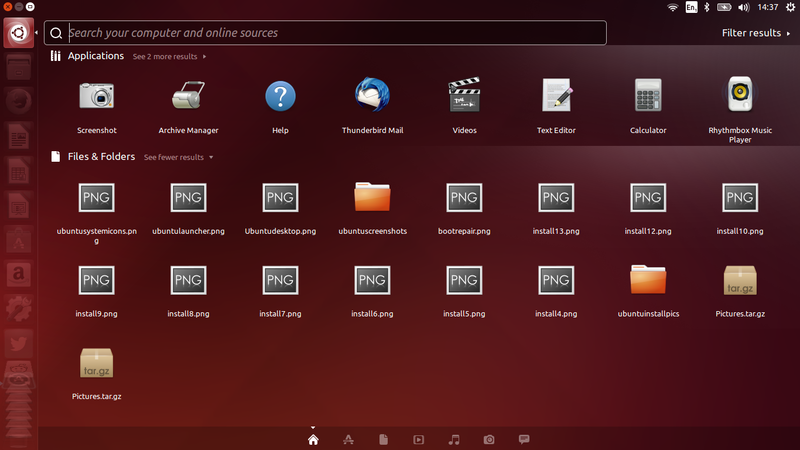 If you integrate the applications into Ubuntu an icon is added to the launcher and when you click on the icon the sites open in a separate window a bit like a standard desktop application. You will also notice an envelope icon in the system tray in the top right corner. If you have integrated accounts you can select them by clicking the envelope icon. One of the biggest criticisms of Ubuntu is with regards to privacy. Basically when you search for something using the Dash then targeted adverts appear in the results list. The chances are that many of you use Google as a search engine and you will surely realise that the adverts are targeted there as well. How many times have you visited a news site and the Amazon advert shows a suggestion about a search term you used earlier? You may restrict your dash so that we don’t send searches to third parties and you don’t receive online search results. To do this go to the Privacy panel and toggle the ‘Include online search results’ option to off. 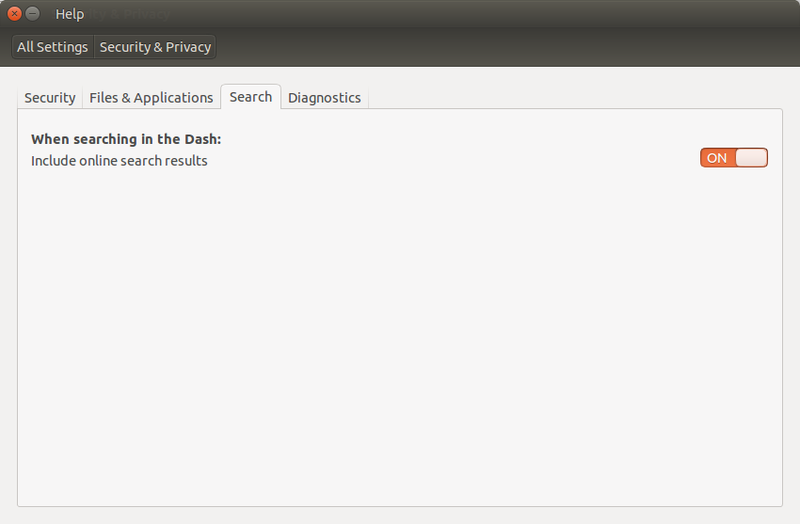 The Privacy panel can be found in your System Settings or via a dash search. For a current list of our selected third parties, please seewww.ubuntu.com/privacypolicy/thirdparties. As you can see there is a way of turning off the online search results and thereby maintaining your privacy. Privacy has obviously become a massive issue around the world with Edward Snowden, Wikileaks, NSA revelations etc. It is up to each of us to decide how far we go to try and protect our privacy. The best place to go to see the new features in Ubuntu 14.04 is https://wiki.ubuntu.com/TrustyTahr/ReleaseNotes. The Linux Kernel is now 3.13. You may have noticed that this review of Ubuntu is a long time after all the other reviews that have been written. There are a couple of reasons for this. One is that I have been backed up with other articles but the other is that I decided to have it on my computer and use it for some time before making a judgement. I have had Ubuntu on my computer for a while and whilst I haven’t used it everyday, the times that I have used it have been largely issue free. The same thing happened with the photos scope. I had to import the images into Shotwell and then reboot to get the photos to appear. When I set the menus to be integrated, LibreOffice decided it would show no menu whatsoever. The tag line for this article is “There has never been a better time to switch to Linux”. There are a number of reasons why this statement is true. Ubuntu 14.04 is supported for 5 years. This means that if you install Ubuntu now then it will continue to receive updates for 5 years without having to upgrade in between. Version 10 of Ubuntu was an LTS release and by the time version 12 came out the desktop environment changed considerably. Version 10 users were at a disadvantage by the time their 5 years were up. I bet if you ask 12.04 users how they feel about their version of Ubuntu then they will be more than happy. It has been a very stable operating system. Where else can you get something for free and be given a 5 year warranty on it? I think GNU/Linux is the best operating system and I think Ubuntu is the best Linux distribution and no more so than for the Everyday Linux User. If you find yourself using the same applications frequently and you use a number of online applications then there really is no quicker way to launch applications than with the launcher or the dash. The hardware integration (which I didn’t really mention) is excellent. My MP3 player, printer and other gadgets were all picked up straight away and they all work well. There is a good selection of software installed by default and the software centre is a decent enough tool for installing applications. If you want to use Linux but want to limit your exposure to terminal commands then Ubuntu is a perfectly good option. There are some reasons for not choosing Ubuntu however. If you have an incompatible sound or video card for instance or your hardware is getting older. In this instance you could consider using Kubuntu, Xubuntu or Lubuntu. 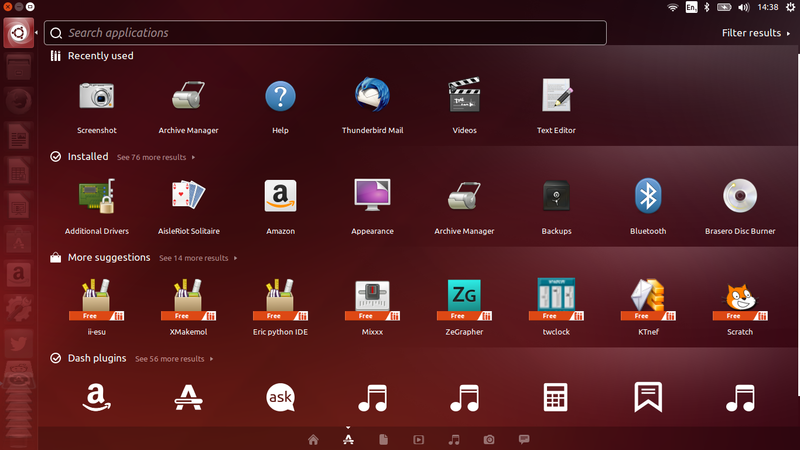 Click here for a review of Ubuntu 14.10 which is the latest release. How does the cloud affect the everyday linux user? I tried Unity back when it was first introduced and I hated it. I've been using Lubuntu off and on since. Your article caused me to take another look at Ubuntu, and I'm glad I did. Unity is much, much improved since its early days. 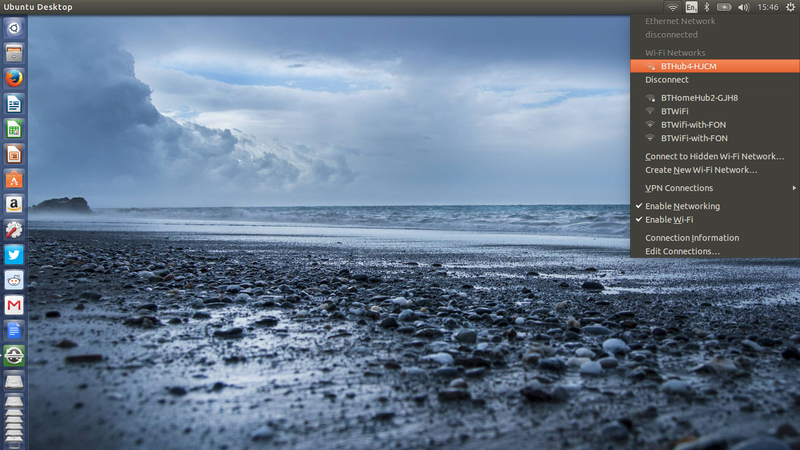 I actually downloaded and installed Ubuntu 14.04 today, something I never thought I would ever do. Thanks for such a great review. I dual boot windows 7 and Linux mint on my laptop. Your article encouraged me to install Ubuntu along side windows 7 on my desktop.Good work. keep going. I just spent some time looking through the Unity 7 search code and it seems to me nothing stops Canonical from obtaining search result data from an Ubuntu user. The legal notice itself hints at this by stating that keystrokes are being sent to Canonical. In other words, Canonical is probably still reading user searches, they just aren't forwarding them. I would prefer if Canonical didn't receive my user file search terms at all. Is this not an issue to anyone? Ubuntu has basically installed a keylogger and is obtaining user data. Why leave Windows (which has a known keylogger) to go to a Linux distribution that also has a keylogger? So, because you can't work with is, it is trash? That says more about you're skills than about the interface. The Mp3 and Flash support (restricted codecs) can be enabled during install by checking a checkbox. I don't know why but that never really seems to work as well as installing the restricted extras package. I am eternally grateful to Ubuntu for weaning me off MicroSoft 3 years ago. 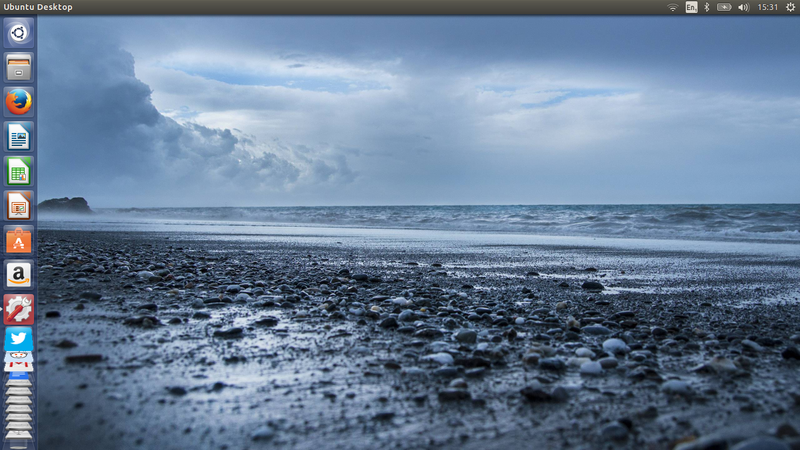 Most of all I am grateful for Ubuntu based LinuxMint which I now use. Just downloaded and burnt DVDs with latest Ubuntu and Mint 16 and installed Mint 16 on old Vista laptop for my totally computer illiterate wife. In my view Mint is far superior and User Friendly., but I realize 'different strokes for different folks' and am glad Linux gives options, unlike the totalitarian mindset of proprietary MS and Apple systems and their devious licensing agreements aimed at preventing freedom of choice among low end consumers. Thanks for the comment. I gave Mint a good review on this site as well. I have no real bias one way or another. If I download this on my Windows 8 laptop, will I be able to switch back and forth between the two? Thank you so much! I got it all working seamlessly together! I believe that the biggest problem with Unity is that to open an application it takes about 3 clicks: 1° – Ubuntu Icon / 2° – Apps Tab Icon / 3° – See more results button… and it makes me wonder why do I have to go through all this pain to simply open an application?…. why does the dash show me a bunch of irrelevant information on the Home Tab and when I click on the Apps Tab it hides the information I am looking for?… It makes no sense!…. and the worst part is that you can't change it! That's why I would never recommend Unity for anybody… how would I explain all this? I hope that the new Unity brings the ideas and concepts from the Unity Mobile to the Unity Desktop! Besides that, it's impossible to step away from Ubuntu or Ubuntu based Distro… Suse = Problems, Fedora = More Problems, Arch = Ennnnnnndlesssss Problems….. If it is an application you use regularly then you can pin it to the launcher. If it isn't then press the windows icon and start typing. There is no need to switch to the apps tab and then expand results. I've been trying to switch from Windows to Ubuntu since 2 years ago, and I always have to revert back to old windows; not because I prefer it but due to the lack of a clean and straight forward Exchange integration and support, now a days it's not real say that most of people can work professionally without having it's mail application integrated to Microsoft Exchange, mails and calendar integration is a must and recently Microsoft Lync 2013 became very popular for video and voice conferences and Pidgin can only support chatting which is not enough. Your comment regarding windows being full of clicks to open any program, and that Ubuntu being just press super and type, is incorrect. With windows 8, I can set my system up to load direct to the desktop, and then to run any program I press the windows key and type… Exactly the same method to open programs. Again windows has the same method for files, just choose apps, setting or files. However that is the only point I'd dissagree with. The rest of this article is 100% on point, and has turned me from pure windows into a dualboot guy. My only issue is with bashing a method in windows to promote Ubuntu when they are user input wise, the same. Thanks a lot for the guide.